At 32, the three-time Olympic track star says she’s more passionate about running than ever. Needless to say, she knows a thing or two about staying focused and in love with the sport for the long haul. Here, she shares her secrets to success when it comes to getting older, wiser—and faster. While Simpson may not be a domestic goddess (she leaves most of the cooking and cleaning to her husband, Jason), there is no denying her super-hero status on the track. One of the most decorated middle-distance runners in U.S. history, Simpson’s resume is as shiny as the gold medal she picked up at the 2011 World Championships in the 1500 meters. 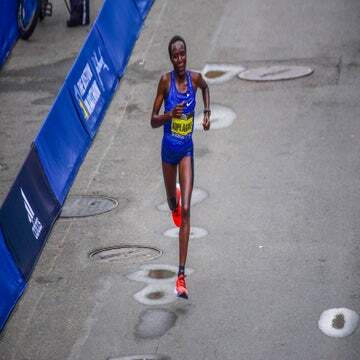 A three-time Olympian (in 2016, she earned a bronze in the 1500 meters), Simpson is the current American record holder in the two-mile and has a record-setting seven straight victories at the prestigious Fifth Avenue Mile to her name. Turns out, she had nothing to worry about. True to form, Simpson made the Olympics—and the final. And she had some extra bling at her birthday celebration, courtesy of that bronze medal. At an age when many middle-distance runners are on the bell lap of their careers, Simpson’s historic finish in Rio set the tone for this new decade: 30 had nothing on her. In fact, Simpson feels like she is now the age she was always meant to be. Her 30s suit her, she says, because in many ways, she has been adulting since she was, well, a kid. In high school, Simpson skipped out on prom and homecoming to focus on big races. As a freshman on a full athletic scholarship at Colorado, she cashed out a college fund her grandparents had set up and used it as a down payment on a condo in Boulder. And then there was Jason. After meeting through mutual running friends, the two dated for just 11 months before getting engaged while Jenny was still a senior at Colorado. At a time when many of her classmates were concerning themselves over the next frat party, Simpson was planning a wedding. The two married in 2010. Indeed, Simpson has stayed firmly ahead of the curve in many aspects of life. And while some of it was happenstance—like falling in love with Jason—most of her major choices throughout life have been made with careful calculation and planning. Of course, it takes much more than maturity and knack for avoiding drama to sustain such incredible success as an athlete. Certainly, a cooperative body helps. Simpson is quick to say that she has been extremely lucky to avoid major injury in recent years, and attributes this to her close-knit support crew of coaches (she has been under the tutelage of her college coaches, Mark Wetmore and Heather Burroughs, for the better part of 14 years), her husband (who supplies moral support and relieves her of household chores) and a host of physical therapists, massage therapists and trainers in Boulder. No doubt, Simpson has goals. Case in point: She not only wants to be on the starting line of the Olympic Games 1500-meter final in Tokyo, but she is ready to contend for a medal, too. So, will winning gold be the moment that’ll have her hanging up her spikes for good? Not quite. This approach has led her to be more relaxed in life, too. Her sister sees it in the way their own relationship has evolved from squabbling siblings with different interests and lifestyles to genuine best friends who talk nearly every single day. Sure, having already accomplished so much in her career has taken plenty of the weight off of her exquisitely sculpted shoulders. But Simpson remains as focused on being among the world’s best—she is just a lot more chill about it. After working for so long to achieve that level of calm, she says she is not quite ready to disrupt it with, say, a baby. Though vocal about wanting to start a family, Simpson is firm on the fact that it will have to wait until retirement. She gives credit to her fellow runners who have been able to balance a professional career with motherhood, but she admits the lifestyle is just not for her. Simpson is practical about the realities of the so-called biological clock (“One day, you wake up and all of your friends have two kids. It definitely sneaks up on you,” she says.). But she’s confident in her decision to ride out her career now and and enjoy kids later. There’s no question that Simpson is as confident in her convictions as she is in the home stretch on the track, but she confesses that there are days when she feels less-than-stellar about herself, especially after scrolling social media and getting caught up in the comparison game. Simpson says that because she is so much more aware of her shortcomings, she purposely tries to avoid situations that zap her confidence, which is a big part of the reason that she’s not super active on social media. While she does occasionally share snaps and thoughts (her favorites are #MondayMotivation posts), she says she is perfectly content checking her feeds once a week. Just how many more medals and records we can expect from Simpson in the next few years is unknown. But what is for certain is that while Simpson may be older, she is also wiser. Stronger. More confident. And yes, perhaps even faster than ever before.